The stellar past of this 18-guest Camper & Nicholson yacht includes ownership by millionaire tycoons, the royalty of Monaco, and a stint in the British Navy during WWII. Guests who cruise aboard the M/Y Grace will get to experience the islands the way Darwin did in the past: personally and privately, but with the added distinction, comfort and elegance of today. Cruise the Galapagos Islands like a Prince and Princess, aboard Grace Kelly’s royal honeymoon yacht. 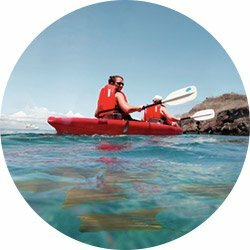 Sea kayaking is offered on all of our cruises and you require no previous experience to enjoy this activity. Our sea kayaks are the ideal means by which to get some good exercise and explore the cliffs and shores of the various visitor sites around the archipelago. A typical cruise week offers great opportunities to go kayaking around secluded coves, shores, mangrove estuaries and beautiful beaches. Galapagos penguins, flightless cormorants, sea lions and many other animals can be seen from up-close on a kayak and even as they swim! A highlight of all our Galapagos cruises, this activity allows you to enjoy spectacular encounters with the Island's wildlife. During each day of your Galapagos cruise aboard M/Y Grace you will have two expeditions to a visiting point on a specific island where you will be able to walk and hike on beaches, lava fields, alongside cliffs and around mangrove estuaries. Our walks and hikes include wildlife encounters, scenic views and detailed lectures and explanations from your naturalist guide on many issues concerning the islands. This activity is great to get amazing shots of wildlife from up-close. The #1 preferred activity by 9 out of 10 guests who cruise with us. It requires no previous experience to be fully enjoyed. You will be offered the opportunity to go snorkeling almost every day at various snorkeling sites around the archipelago. You will have the chance to snorkel with playful sea lions, marine iguanas, green sea turtles and many other wonderful creatures. For non-divers, this is an incredible way to get a glimpse of the marine. On all of our cruises we offer daily dinghy or "panga" rides to several visitor sites aboard inflatable expedition zodiacs. The group, of up to 9 guests per zodiac, is taken for a ride alongside cliffs and shores, secluded coves and beautiful mangrove estuaries. This activity is great to see volcanic formations as well as shore birds from up-close. In the mangrove estuaries it is very common to see green sea turtles mating, golden & eagle rays and sleeping reef sharks! 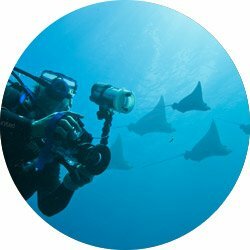 This activity provides various chances to get some great photographs of marine creatures from up close! Optional activity (not included in our cruises). This activity gives you a chance to explore the underwater world of the Galapagos at its best. Taking you off-the beaten path, to see wildlife and places that few travelers get to see. 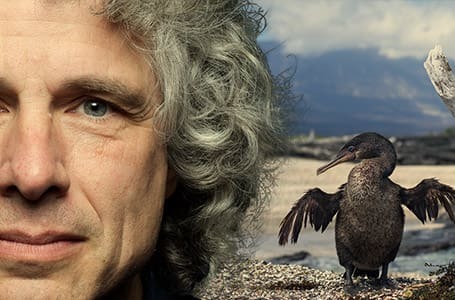 Daily opportunities to see some of the strangest and most exotic birds in all of the world. One of which, due to the lack of predators, lost its ability to fly! For bird lovers, the Galapagos Islands offer you the opportunity of seeing shore birds, water birds, sea birds and land birds daily. Some of these birds appear to be taken out of a fiction book. And best of all, because they are unafraid of humans, you don't need big lenses to get amazing shots. 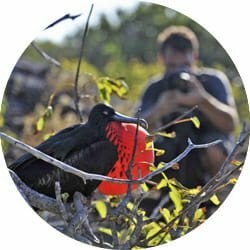 Birdlife in Galapagos literally will pose for the perfect shot. Galapagos skies are starry and bright. Enjoy star-gazing experiences during several nights of your cruise, led by our experienced naturalists guides. 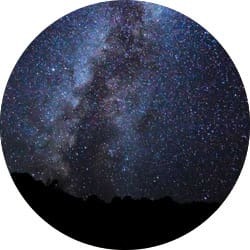 Being right on the equator, and because of the lack of light pollution, Galapaogs skies are ideal to witness the constellations of the Northern and Southern Hemispheres. Whales and dolphins are a part of all our Galapagos cruises, especially between the months of August - November. 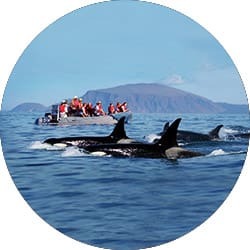 Whale spotting and snorkeling with wild dolphins is quite common in our Galapagos cruises. 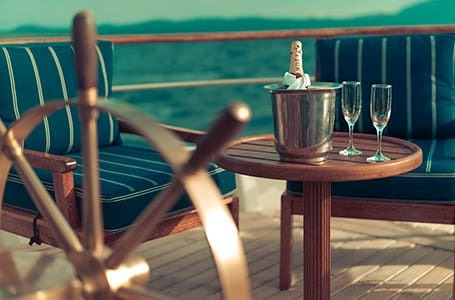 During the longer navigations, you may even see dolphins riding the waves in front of your yacht. Get ready for some spectacular encounters with Galapagos' best sea mammals. 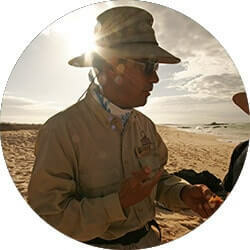 Galapagos is the perfect place for children and adults alike to enjoy nature at its best. Our yachts are perfect for families. From the special activities we offer onboard for children, like star-gazing, movie nights and our Young Explorers Club, cruising the Islands as a family is an unforgettable experience. From Princess Grace Kelly’s honeymoon yacht to Aristotle Onassis and Winston Churchill. Experience our destinations in front-row seats and away from the crowds. Our adventures are entirely free of single-use, disposable plastics. When you travel with Quasar, plastic waste as a result of your presence is kept to a minimum. We have eliminated single-use plastics from all our trips, including plastic straws, single-use disposable soaps and single-serving edible products. Professionals who make the difference between a good and an exceptional adventure. Itineraries that take you off the beaten path, for spectacular up-close encounters with nature. Our unmatched itineraries give you a unique perspective of the destination that is only experienced by a special few. Our experiences are fully immersive and they guarantee some of the most spectacular encounters with the destination’s exotic wildlife. You will be welcomed and pampered only by the best. 97% of The Galapagos Archipelago is a National Park only accessible by yacht. 97% of The Galapagos Archipelago is a National Park and only 3% is inhabited by humans. Considering that 10 of the 13 major islands are only accessible by sea, cruising the Galapagos by yacht is the best and only way to visit this natural paradise. 30 years of life changing adventures, since 1986. When cruising the tropical waters of the Galapagos, outside is where you want to be. Our yachts are tailored specifically for Galapagos, offering our guests an experience that encapsulates the wildlife, scenery and environment. M/Y Grace abides under all international standards of safety for a Galapagos cruise ship of its type. 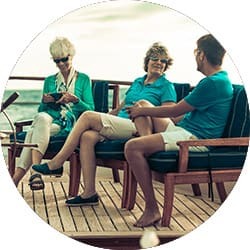 Our yachts were selected and built to experience the islands the way we did long ago, personally and privately but with distinction, comfort and elegance. Enjoy your Galapagos adventure in the company of your loved ones. Take those photos of a lifetime on our photo departures. Get the best light and take advantage of our guides’ knowledge for those unique locations and angles. 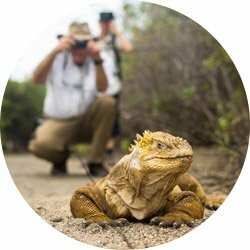 Maximize your time in Galapagos focusing on what you like best. Travel to this natural wonderland as the founders once did: privately and intimately. We invite you to be enchanted, by the Galapagos Islands. WHY 7 NIGHTS / 8 DAYS? 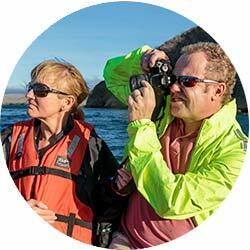 For over 30 years, Quasar Expeditions has ONLY offered 7 Night / 8 Day Cruise Itineraries in Galapagos. Experience has shown us that 8 Days is just right to maximize your time for exploration, amazing animal encounters and for some balanced downtime for optimal relaxation. 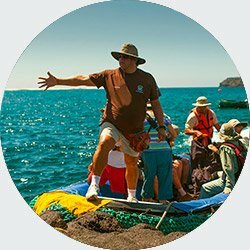 Probably the biggest mistake a traveler can make when visiting the Galapagos is simply not leaving enough time to see it, especially since both the first day you travel to the Galapagos and the day you return to the mainland are down days. There is really no better or worse itinerary when onboard our ships, they are just different. When visiting the Galapagos Islands for one week there are tradeoffs regarding the landing sites you can and can’t see, in a place where one can encounter as great a variation crossing from one side of a bay or island to another, as traversing the entire archipelago. This particular itinerary begins on San Cristobal Island and ends on Baltra Island, focusing on the wilds of the central and Southern Islands of the Archipelago. We highly encourage you to go through the entire itinerary, day by day, using the arrows, to learn all about the wonders that await when going "Beyond Darwin’s Footsteps". Lobos, lives up to its name of -Sea Lion Island- with its noisy population of frolicking and barking beasts. It lies just a short navigation north, up the west coast of San Cristobal, separated by a channel that forms an inviting lagoon. This is where you'll have your first chance to share the water with a playful colony of the "wolves of the sea". From lobos we should have views of Kicker Rock, a spectacular formation that rises 152 meters (500 feet) out of the Pacific. It takes the form of a sleeping lion, but from another angle you can see that the rock is split, forming a colossal tablet and, piercing the sea, a great chisel ready for etching. Hood is the southernmost island of the archipelago, and is one of the most popular due to the breathtaking variation and number of fauna that inhabit the island. 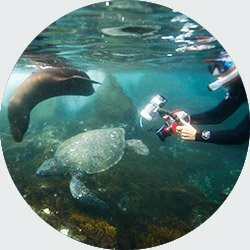 In the morning we visit Punta Suarez where you will witness the largest variety of marine iguanas in the Galapagos, masked boobies and blue footed boobies nesting along the cliff’s edge, as well as the famous waved albatross. Floreana Island: Cormorant Point & Champion Islet Floreana has had a colorful history: Pirates, whalers, convicts, and a small band of somewhat peculiar colonists—a Baroness among them—who chose a Robinson Crusoe existence that ended in mystery and death. We visit Post Office Bay, where in 1793 British whalers set up a barrel as the island‘s Post Office, to send letters home on passing ships. The tradition continues to this day, simply by dropping a post card into the barrel without a stamp. santa cruz island: highlands and the charles darwin research st.
Bartolome Is. : Pinnacle Rock & overlook & North Seymour Is. In the morning we visit Bartolome Island, famous for Pinnacle Rock, where we will see Galapagos Penguins and sea lions. We will also hike a trail to Bartolome's summit where you will be rewarded with spectacular views of Pinnacle Rock and our beach, where the crystal blue waters of the bay cradle your yacht. This particular itinerary begins in Baltra Island and ends in San Cristobal Island, focusing on the wilds of the Northern and Western Islands of the Archipelago. We highly encourage you to go through the entire itinerary, day by day, using the arrows, to learn all about the wonders that await when "Following Darwin’s Trail". Traveling in future dates? Click here. Quasar Expeditions' Galapagos cruise itineraries are subject to change without prior notice for various factors including, but not limited to: safety, weather, mechanical breakdown, unforeseen emergencies, and the discretion of the Captain, Guide, Dive Master, Quasar Expeditions and the Galapagos National Park. Quasar Expeditions’ Galapagos cruise itineraries are subject to change without prior notice for various factors including, but not limited to: safety, weather, mechanical breakdown, unforeseen emergencies, and the discretion of the Captain, Guide, Dive Master, Quasar Expeditions and the Galapagos National Park. Retail Rates are per person & are valid from January 1 through December 31, 2018, 2019 or 2020. 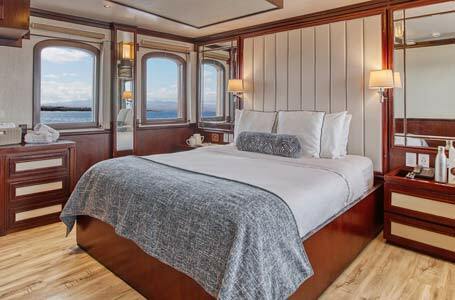 *All Twin Cabins aboard M/Y Grace can be converted to offer 1 Queen bed. *All other cabins have 1 Queen bed. 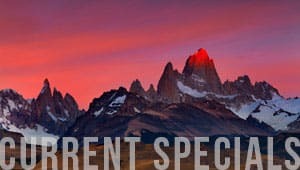 *Payment Schedule for reservations for 1 to 5 Travelers: A $500 non-refundable deposit per person is due at time of booking, final payment due 65 days prior to departure. *Payment Schedule for Groups over 5 Travelers & Charters: Please inquire with us. * ‘Willing to share’ accommodations are not offered by the Tour Company. *Supplements & surcharges can be subject to change without prior notice. Note: Current/additional taxes and surcharges not explicitly mentioned on this document may also change/apply depending on the rules, regulations, legislation and discretion of the Galapagos National Park and the local government. These may especially apply if local authorities raise the price of fuel in the Galapagos which as of April 1st, 2013 is set at $3.250062 USD / Gallon. 15% discount off the above rates (cruise only) for children 15 years old and younger. Maximum of 3 children discounts per family, per booking. No exceptions. 75% Single Supplement surcharge applies to suites. 50% Single Supplement surcharge applies to other cabins. 100% Single Supplement applies in all cabins and no discounts for children in Christmas and New Year’s cruises. An additional $500-$700 per person holiday surcharge applies for FIT (individual passengers) for Christmas and New Years cruises. Private charter surcharges apply for Christmas and New Years cruises. Please inquire with us for details. 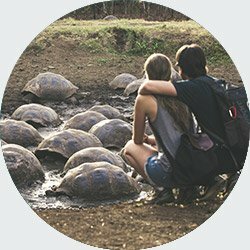 To confirm a Galapagos reservation: A $500 USD non-refundable per person deposit is due from the Customer at the time of booking. FOR RESERVATIONS OVER 5+ TRAVELERS OR CHARTERS, please inquire with us about the Payment & Cancellation Policies. Forms of payment: Forms of payment accepted by the Tour Company include wire transfers, credit cards and checks. Detailed information regarding forms of payment will appear on the Customer’s invoice or will be provided upon request by the Tour Company. For Travel professionals, please note we do not accept credit card payments, only wire transfers or checks. Payments are due in the Tour Company’s offices on the due date specified on the passenger’s invoice and should be sent in a timely fashion to arrive by the above mentioned date. Failure to do so may result in the release of cabins, with rebooking subject to availability at the desecration of the Tour Company. The following cancellation fees will be applied to the Customer according to the number of days prior to departure that the Tour Company receives written notice of cancellation from the Customer. All cancellations must be made in writing and should be sent via email to the sales agent who made the Customer’s reservation for the Tour Company. How to guard against cancellation fees: The Tour Company strongly recommends the Customer purchase trip cancellation / interrupt insurance directly after the reservation is confirmed. This coverage reimburses the Customer for most non-refundable costs of the tour should he or she need to cancel due to illness, injury or other reasons covered under the policy. For passengers with pre-existing conditions: coverage must typically be purchased from a travel insurance company within 24 hours from the time a reservation is confirmed to cover cancellation resulting from the pre-existing condition. Please click here to view our complete Terms & Conditions. This particular itinerary begins on Puerto Ayora on Santa Cruz Island and ends on Baltra Island, focusing on the wilds of the central and Southern Islands of the Archipelago. We highly encourage you to go through the entire itinerary, day by day, using the arrows, to learn all about the wonders that await when "Beyond Darwin's Footsteps". Today we fly to Baltra Island in the Galapagos in the morning. Flight time is just under two hours from the mainland. Upon arrival we take a bus to Los Gemelos, crossing the Itabaca channel and taking a 15-20 minute bus ride. After our visit, we are off to the Highlands of Santa Cruz, where the dry coastal vegetation transitions to lush wet fields and forests overgrown with moss and lichens. Our destination is the Tortoise Reserve, where we will have chances to see these animals in the wild and walk through lava tubes. In the afternoon, we will board the M/Y Grace and later, visit the town of Puerto Ayora, which is the economic center of the Islands. We will visit the Charles Darwin Research Station to visit the Giant Tortoise and Land Iguana Breeding and Rearing Program. Here we used to find Lonesome George (now deceased), the last of his particular race of tortoise. Floreana Island: After breakfast we travel in an open-air bus into the highlands of Floreana, while your Naturalist Guide begins filling you in on the history of this, the first settled island in the Galapagos. You will walk to the Asilo de la Paz (Peace Asylum) where one of the islands’ few springs is located. This artesian spring attracted pirates, whalers and later settlers to Floreana as it was one of the very few year round sources of fresh water in the Galapagos. The Cueva de los Piratas (Pirate's Cave) is quite literally where pirates carved temporary shelter out of soft stone and is also where one of the original settlers, Margaret Wittmer, gave birth to a son, Rolf, who is still living. We will visit a tortoise reserve where you can watch many of the giant tortoises up close and personal. Punta Pitt is on San Cristobal Island and offers impressive views after climbing up a steep narrow path onto a plateau surrounded by reddish hills. Depending on the time of year, there may be nesting marine iguanas, red footed boobies and other marine birds down on the cliffs. In the morning we visit North Seymour Island which is teaming with wildlife! Cliffs only a few meters high form the shoreline are home to swallow-tailed gulls. A tiny forest of silver-grey Palo Santo trees stands just above the landing, where a trail will take us to see sea lions, marine iguanas, blue footed boobies, pelicans, magnificent frigate birds and land iguanas. Morning visit to Chinese Hat Islet, a fairly recent volcanic cone; it has the shape of a down-facing Chinese hat. On the rocky shoreline of nearby Santiago, Galapagos penguins are often seen. There is a small sea lion cove on the north shore, where boats anchor and land at the visitor site. Late morning snorkeling with sea lions and penguins and swimming opportunities in the cove. This particular itinerary begins on Baltra Island and ends on Puerto Ayora, focusing on the wilds of the central and Western Islands of the Archipelago. We highly encourage you to go through the entire itinerary, day by day, using the arrows, to learn all about the wonders that await when "Following Darwin's Trail". Today we fly to Baltra Island in the Galapagos in the morning. Flight time is just under two hours from the mainland. Upon arrival we board your yacht where you will have lunch and a quick briefing en route to our first visitor sites: Bachas Beach. In the afternoon we visit Las Bachas, a sandy white-coral beach that is a major egg-laying site for sea turtles. The name Bachas refers to the remains of landing craft left here at the end of WWII. Ashore marine iguanas mingle with flamingos and other wading birds in another of the many super saline lagoons found in the Galapagos. Tower Island could serve as a film set for a secret submarine base! The southern part of the island is an ocean-filled caldera ringed by the throat of a sizeable and mostly submerged volcano. The island sits to the northwest, slightly removed from the Galapagos archipelago. It is also known as "Bird Island" and home to Prince Phillip’s steps. This is the best Galapagos landing site to see red footed boobies, comically perched by wrapping big red feet around tiny branches. We walk a short distance to seek out short eared owls preying on swarms of storm petrels. The snorkeling at the foot of the steps is amazing with large, brightly colored tropical fish taking on a neon quality against the black lava background. In the morning we visit Punta Vicente Roca on Isabela Island. Snorkeling is incredible here as a result of the nutrient-rich waters of the Humboldt Current that bathe the western side of the archipelago. We will have a chance to see colorful fish, sea lions, penguins and sea turtles in the water. Morning visit to Fernandina Island, home to La Cumbre volcano, which erupts frequently (most recently in May 2005). We visit Punta Espinoza, a narrow spit of land, where a number of unique species, such as flightless cormorants, marine iguanas, sea turtles, Galapagos Penguins and Galapagos hawks can be seen in close proximity. A panga ride brings us to a protected mangrove lagoon, where sea lions sleep in trees (tree lions). Sea turtles and manta rays surface in the quiet waters while Galápagos hawks circle overhead. Outside the lagoon sit three islets known as Las Marielas, home to the largest concentration of Galápagos penguins on the islands. Traveling in earlier dates? Click here. Retail Rates are per person & are valid from January 1 through December 31, 2019 or 2020. 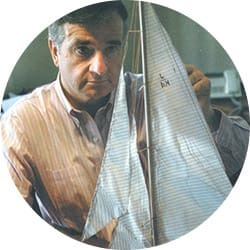 Born in 1928, Camper and Nicholsons, the oldest leisure marine company in the world, producing and managing yachts for the world's richest people, constructed the M/Y Grace in Southampton, England. She weighed 298 tons, was 147 feet long, with a 23-foot beam and a draft of 12 feet. M/Y Grace bore many names since Santiago Soulas, an Argentinean, commissioned her just before The Crash silenced the Roaring Twenties. Soulas named her after his daughter Monica, and kept her four years before selling her to Zarch Couyoumbian, a Greek gentleman who named her Rion. In 1938, Sir George Tilley, chairman of the Prudential Insurance Co., acquired and enjoyed her until 1939, when the British conscripted her for the war effort. The Royal Navy - well-heeled in warships - needed smaller vessels for coastal patrols and snatched yachts from the Mediterranean and the Caribbean playgrounds. Rion found herself in a Tynemouth shipyard, stripped of her furnishings and paneling. She was strengthened to carry a 12-pound quick-firing gun on the forecastle, twin 40mm Oerlikons alongside the bridge and a rack on the stern holding eight 300 lb. depth charges. The corporate crew quarters were removed and hammock-hooks were welded to the deck. The forward suite became the operations and sonar room, another suite became the radio room, and the aft suite was an ammunition magazine. On October 21, 1939, she joined the Royal Navy with a crew of 20 under the command of Lt. T. Brydon, RNVR. She and 15 other vessels patrolled the entrances to the Solent and along the Isle of Wight: calm waters with the Germans focused on the skies. On patrol off the Nab Tower, however, a Dornier 110 returning from a bombing raid strafed Rion. She took some damage to her superstructure but suffered no casualties. On May 26, 1940, during Operation Dynamo, Rion was dispatched to the beaches of Dunkirk to evacuate the British Expeditionary Force. She made three 39-mile runs from Dunkirk to Dover, each time delivering 300 soldiers. On her third run, a near-miss from a bomb off her starboard bow killed 14 soldiers and one sailor and left shrapnel holes in the hull. Repaired in Portsmouth, she resumed duty in the channels from Portsmouth to Southampton..
Rion’s finest hour came on November 22, 1940 with a daring nighttime capture. She was patrolling south of the Isle of Wight with HMS Shemara and HMS Valera. At 2:44 a.m. radar contact was obtained 10 miles southwest. Lt. Brydon ordered pursuit and discovered a German E-boat floundering in the swells, and Rion and Shemara opened fire from astern of the boat. The Germans returned small-arms fire but surrendered when a shell from Rion hit her bridge. Rion escorted the E-Boat to the Portsmouth Harbour naval base. Rion had not finished yet: she discovered a submarine on the night of March 23, 1941, and made numerous depth charge runs, but the large oil slick seen at dawn was insufficient evidence to confirm that Rion had destroyed the U-boat. By June 3rd, Rion’s port engine had been crippled, and she was decommissioned for three months before returning to duty: stripped of armaments and refitted with three-tier bunks and a red cross painted on her sides and upper deck, she became an annex to the Royal Navy Hospital. Here she remained until the war’s end, when she was rechristened HMS Noir. Sir Winston Churchill cruised on her after the war. On October 1945 she was decommissioned and 17 months later she arrived at her original builders—Southampton’s Camper & Nicholson—for restoration. On September 16, 1947 she was returned to Sir George Tilley. Upon Sir George’s death in 1951, Aristotle Onassis’ charter firm acquired HMS Noir and renamed her Arion. Two years later, the yacht became property of Prince Rainier and Princess Grace of Monaco as a wedding gift from Aristotle Onassis. The royal couple honeymooned aboard the boat—which they christened Deo Juvante II—along the coasts of Corsica and Sardinia. 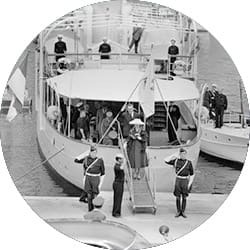 (NY17-March 9)--BEING READIED FOR THE WEDDING-- This yacht ‘Deo Juvante,’ owned by Prince Rainier III of Monaco, which is enroute to Toulon, France where it will be repaired and refurbished in preparation for its use at the time of the wedding next month of Prince Rainier and American actress Grace Kelly. The yacht is shown in the harbor at Monte Carlo. (APWirephoto) (gfr614401LON) 1956. The royal couple disembarking the Deo Juvante II at Monte Carlo. The royal couple kept her until 1958, when a Monegasque businessman purchased her and renamed her Daska. Crest Shipping’s charter business brought her to the Bahamas in 1960. In 1965, she joined Cove Shipping in the Caribbean as Angela, headquartered in Montego Bay. She again became Daska in 1983, before seizure by the Jamaican government for non-payment of taxes. She languished in Montego Bay until 1985, when John Issa, chairman of SuperClubs, discovered her at auction. Thoroughly refitted in Tampa, Florida, she cruised along the East Coast, bearing the name of one of John Issa’s daughters: Zein. M/Y Zein arrived in Negril for the opening of Grand Lido Negril in 1989 and remained there until 2006, tempting buyers from around the world, including Paul Allen, co-founder of Microsoft, who hoped to use her as a shadow boat for his mega-yacht. In 2007 Quasar Expeditions acquired the M/Y Zein and rechristened her the M/Y Grace: a name that would take her back into her history, to her most elegant times. Over the course of the next 2 years the yacht was rebuilt completely from the ground up. She was outfitted with the latest equipment to meet the needs of modern times. Today, she is the most elegant and tasteful Galapagos cruise yacht to sail the enchanted Galapagos Islands. Although M/Y Grace looks as young and chic today as the princess who honeymooned aboard her in the 1950s, she is nonetheless what the French call "une femme d'un certain age.” She’s surrendered none of her youth’s glamour to the scars and wrinkles of a gallant life, including a stint chasing submarines during World War II. Combat aged on her, but benefactors like Aristotle Onassis, John Issa, and Prince Rainier ensured she was kept in the style to which she was accustomed. 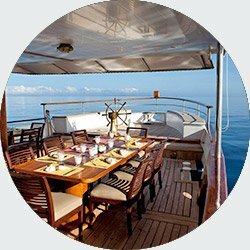 Now, as the M/Y Grace, she plies the waters of the Galapagos Islands, once again the elegant hostess to carefree, adventurous, perfect parties. The first time we sailed the Galapagos Islands was onboard a 1902 Baltic trader, a wooden sailing boat that transported cargo in the Baltic Sea. Her accommodations were probably not much different from those offered onboard the HMS Beagle when Charles Darwin first visited the archipelago. Nonetheless, the enchantment of the islands, untouched by human hands, was planted deep in our hearts. We knew then, the Galapagos was a place to be experienced as privately and intimately as possible. This was the birth of Quasar Expeditions. Our yachts were selected and built to experience the islands the way we did long ago but with distinction, comfort and elegance. We remember when we took our children onboard our first yacht, how wonderful it was to feel that nature was putting on a show exclusively for us. Sharing the encounters and discoveries of every day exculsively with your loved ones, is a wonderful priviledge. We invite you to be enchanted by the Galapagos Islands. ENGINES 8 cylinder - Twin Deutz -500 bhp ea. GENERATORS 2 Caterpillar 75KW ea. CREW 9 crew members plus 2 naturalist guides & 1 cruise director. NAVIGATION EQUIPMENT 72 mile Furuno Radar 19-53 CBB Navnet, Furuno GPS satellite navigator system, Furuno Depth Sounder, Simrad HS50 Electronic Girocompass, speed and distance log, compasses, barometers, forward looking echo sounder. M/Y Grace abides under all international standards of safety for a Galapagos cruise ship of its type. It is ISM (International Safety Management) certified and is equipped with an emergency alarm system, 3 emergency life rafts for 26 pax each, emergency life vests, fog horns, a PA system, smoke detectors, a sprinkler system and fire extinguishers. All emergency equipment is SOLAS certified. The yacht also carries 2 dingies (pangas/zodiacs) for 12 pax each for day to day activities. Are you already booked on a trip with us?